I have written at length on pricing as a customer driven strategy, as a share of value created and the factors that bring down the value. The methods and levers I described work if you have control over pricing in your value chain and if you have direct connection to your customers. In eBook publishing, especially for independent authors, the readers are not your customers but are owned by the platform (the channels like Amazon). You depend on the channel to get access to its customer base and when you do that you yield pricing control to the channel. Out goes all the principled value based pricing. Now the pricing is set by the channel’s goal to maximize profits and not yours. When you sell your ebook through Amazon Kindle you get to set the price but within the small range carved out for you that is unrelated to value of your content. Your content is treated as substitutable commodity and not measured on unique value created for the readers. You have the option of two royalty rates that come with their own pricing restrictions. If you are attracted to higher percentage of 70% your amount is limited to $7. If you are attracted to the highest possible royalty amount of $70 and set a price of $200 you are limited by the volume at that price point. With these price fences you are most likely to price the book between $0.99 and $9.99. 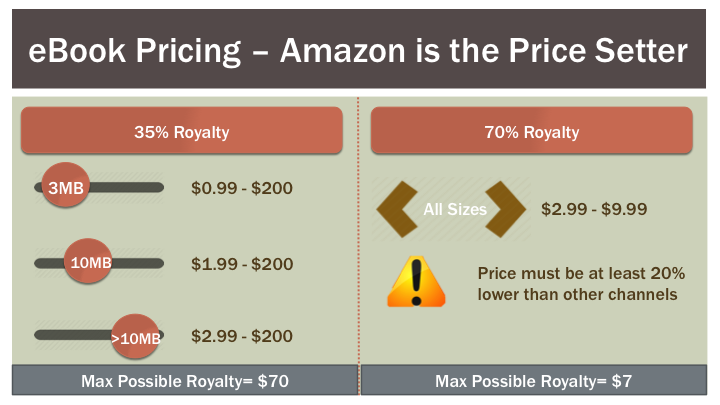 There is no point in pricing it between $9.99 and $20 as you only increase the price to customers (and revenue to Amazon) with no upside and possibly downside volume. 35% royalty on $10-$19.99 is less than or equal to 70% royalty on $9.99. Beyond $20 most sales volumes fall as the reference price for even hardcover books is set around $20. If you price it at $200 your volumes are going to be so small that you are better off building your own marketing and sales channel than depend on Amazon for distribution. And you get to keep more than $70 of the $200 price. Is there a way to set price differently in this case? Break your book into multiple parts and price them in the $2.99-$9.99 range. If it indeed adds unique value and not substitutable fiction you will get better pricing control.But that is still a simplistic solution. There really is no better way or value based pricing in ebooks. Now you know how I priced my Groupon book.